Having already broken my strict chronological rule for this blog in my last post, it’s been such an exciting time on Tankerville this week that I just couldn’t resist sharing another real time post with you all. The first ten days in May, as everyone will remember, have always been synonymous with Year 11 Leavers Day. At Church High, this involved a ritual: everyone dressing to a theme, Miss Chapman’s Award’s Presentation, a memory tree and group photograph under the cherry tree in the Junior School grounds all being ‘de-rigour’. Year 11 Leavers of 2013 pose together under the cherry tree. Well, she may be still surrounded by tree protection fencing but that little old cherry tree is still going strong you will be pleased to hear. Perhaps it’s been the late spring or the fact she is now growing in the shadow of the large new-build, but she has just started to blossom. 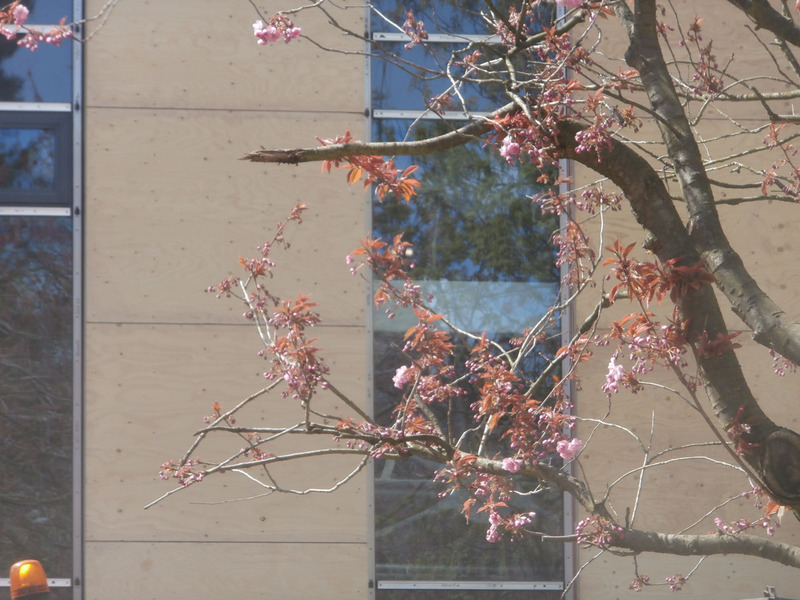 The two old Junior School cherry trees are both now just starting to come into blossom. It was a really joyous sight to see both trees in blossom once again. The fact they have both survived the building work is hopefully an indicator that some of the old traditions might still continue. 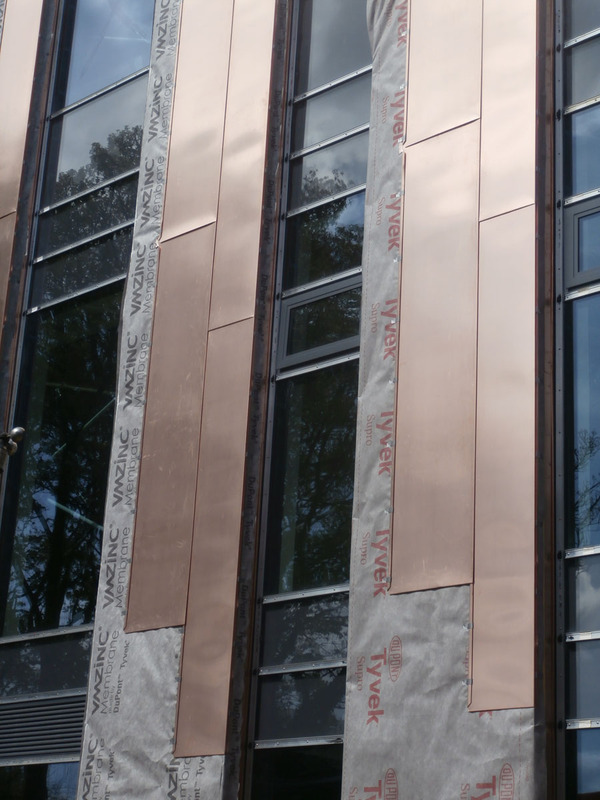 But the main reason I was keen to get on site this week was to see whether any of that bronze cladding had been put in place yet. And it had. 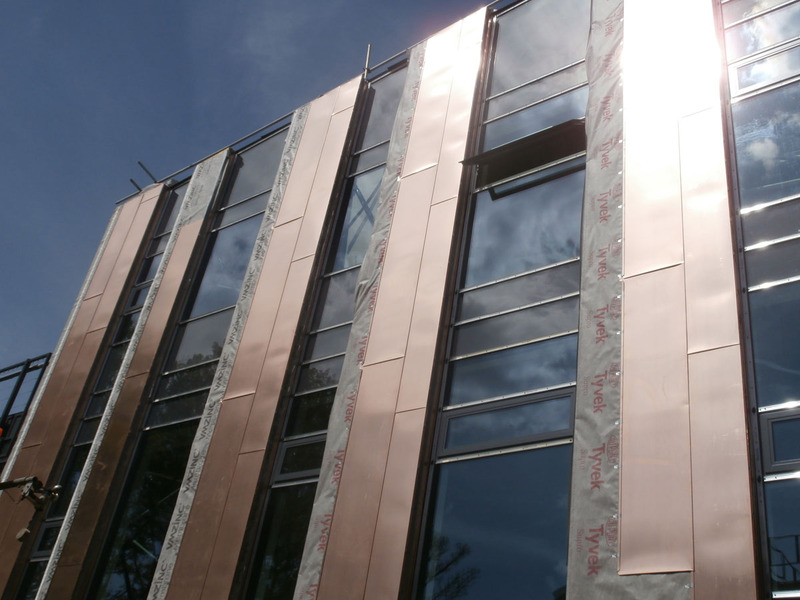 The first pieces of bronze cladding in place. 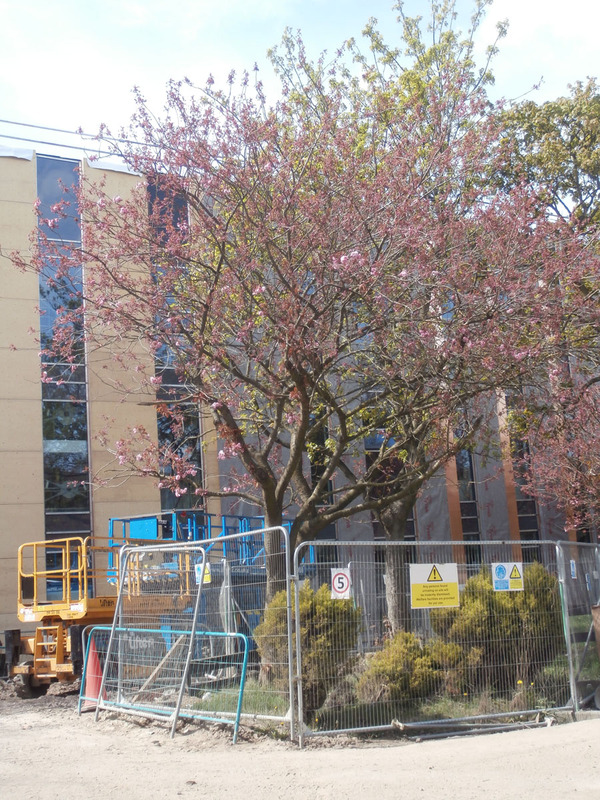 The south face of the new-build shines bright in the sunshine. The metal cladding does look very impressive indeed, it has to be said. And I’m sure it will look truly fantastic when it is finished. 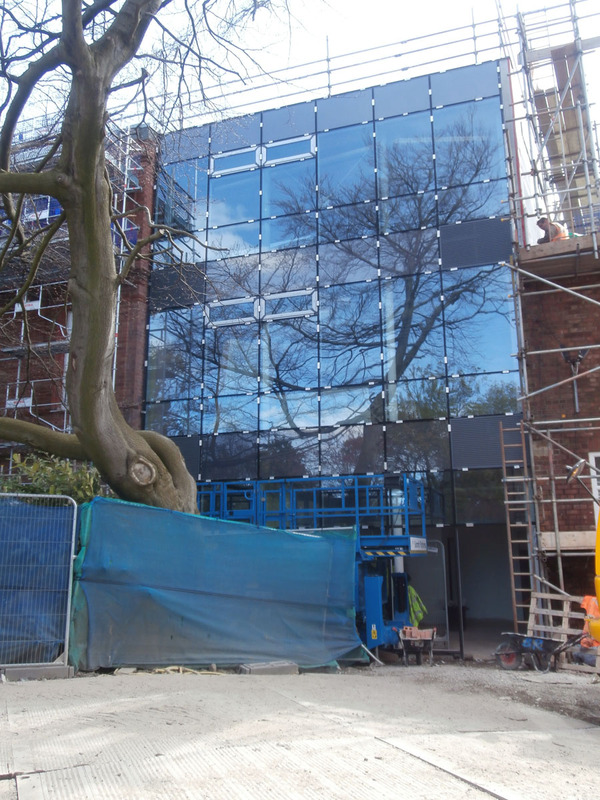 However, I’m really a nature girl at heart and, for me, the loveliest thing on site that day was the reflection of Tankerville’s oldest tree against the bright blue sky in the plate glass of the new extension. 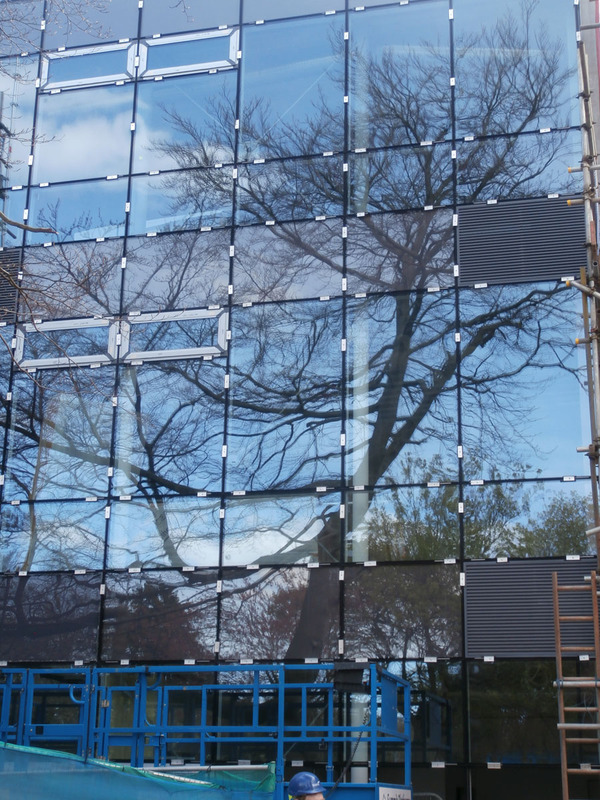 The extension’s glass front is now complete. The blue of the sky & dark green of the forest. The reflection is impressive now, but it can only surely get better once that beautiful old tree is finally in leaf. This site always has been about the blue of the sky and the dark green of the forest.